UFC 214 brings the long-delayed sequel to MMA's greatest grudge match. After their first fight in UFC 182 in early 2015, the path to the rematch has been through a rollercoaster. Jones was stripped of his title and faced an indefinite leave. Cormier won the belt. The rematch was finally scheduled for UFC 197 when DC pulled out. And finally for UFC 200 when Jones was busted by USADA. After over two years, the two are finally set to clash. In spite of his long layoff and looking rusty in his return bout over a year ago, Jones comes as an even bigger favourite than their previous bout. 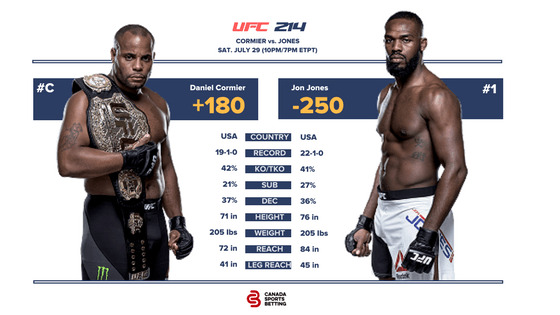 Odds had Jones close as a -240 favourite in their first fight and Jones is now trending upward of -250. The betting public sees this rematch finishing with similar results but this is assuming both fighters are still in their same form as they when fought or that Jones is even better now. Jones's return fight against Ovince Saint-Preux looked unimpressive but OSP was a different stylistic matchup to Cormier. Jones took the approach of minimizing his risk and fought smartly. Against Cormier, he won't be as composed but he won't get too reckless. Jones already has the blueprint of defeating his archrival: keep the fight at his range and neutralize him when he gets inside. Cormier has an opposite body type to Jones. While the Greg Jackson fighter has the longest reach in the promotion, Cormier has a short reach and even smaller fighters have longer reaches. But Cormier possesses the potent NCAA Division I wrestling background and incredible durability to bully his way though not against Jones. Despite lacking the same wrestling credentials, Jones took Cormier down three times in their first bout and stuffed all but one of Cormier's attempts. What's new is how Jones adapts to having a slightly more muscular frame. Jones got into powerlifting during his time off and increased muscle mass by quite a bit. He is making weight just fine but his endurance could be affected. Jones outlasted Cormier before by handily winning the championship rounds. Cormier will have to improve on his cardio as he gassed out from his constant wrestling attempts. He'll have to take a more measured approach and find ways to be more effective against Jones from inside. Jones looks even more focused in this fight than he did before. Cormier has aggravated the former champion and it will lead to his downfall. He threw everything against Jones in the first fight and came up short and his chin has been battered in his previous fights. Jones could finish DC and even if he is somewhat rusty, he should still win. A straight bet on Jones will cash and still has good value but throwing him in a parlay with some fighters below could be the way to go here. UFC 214 is stacked and features two more championship bouts before the main event. Tyron Woodley (-210) defends his welterweight belt against unstoppable grappler Demian Maia. The Brazilian has won seven-in-a-row all via his grappling. Woodley has been outgrappled before but has the striking advantage. Maia is a sitting duck on his feet. Woodley has a 91% takedown defense and is strong in the clinch. He'll neutralize Maia's grappling and put him away especially when Maia begins to fade. Parlaying Woodley with Jones is even odds (+100). Great value. The third title fight features wrecking machine Cyborg Justino (-1200) as a massive favourite against Tonya Evinger. Cyborg has destroyed everyone but has not faced a tough grinder like Evinger. There is upset potential here if Evinger can grind Cyborg out but she's at a size disadvantage. Betting Cyborg straight is folly but adding her to a parlay can sweeten the deal. Sportsbooks also let players bet in any fashion they want like prop bets. Betting Cyborg to win by T/KO cuts the odds to -615 for a start.